These pontoon boat seats make up our Classic CG1804 pontoon furniture set. 2008 Suncruiser by Lowe SS220 Ser. # LWCP0114H708. What order # do I need for rear an side, left front and right front, driver seat and pedtial, sun bath deck across back over motor and fuel tank? You would need to follow the link below and give them to us. 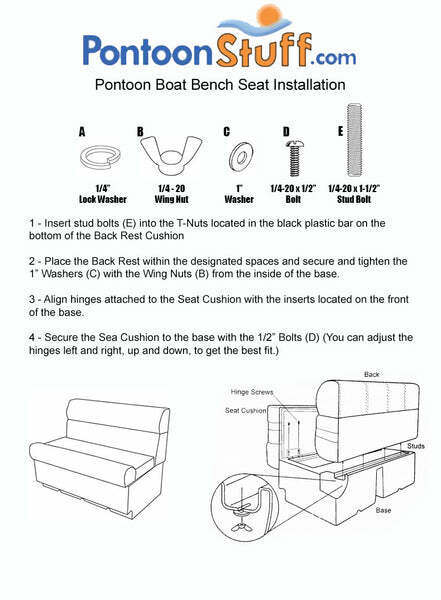 We then can find the best fitting seats for your Pontoon Boat. I have a '90 24' Playbouy. I'm replacing all seats. My front bench seats are 52" with a separate 8" radius arm rest on one end. Can a 52" bench seat be found? No, unfortunately, we do not carry a 52" inch Pontoon Boat Seat. The largest Pontoon Seat we have is a 55" in the Premium line. 90" minimum needed across rear for pontoon boat seats. 45" minimum needed to install pontoon seats in front of pontoon. Unfortunately nothing is standard in the pontoon business and builders tend to change with every year so knowing the model won't tell us exactly what we need. Lucky for you we can get close to matching your exsisting layout or you can redisgn the lay out completely. You will need to measure for new seats then you can use our designer to set up your layout. I have included links to both below. In terms of the pad that goes over the rear of the boat, this is often called a sun deck or pad. We offer matching vinyl by the yard that will match our seats. Most customers will have a local upholsrty shop recover the pad with the new matching vinyl. This again is an item that differs by brand and year so we can not make an exact match to your exsisting boat. I’ve got a 22’ Hurricane Deck Boat 226FOB. I need all new seats and console. Then give us a call and we can find some seats that will work for you. I have a 20' 1987 suntracker bass buggy pontoon. Im wanting bench seats to fit the corners up front. I know they would be smaller. Is there anything available? Is the foam itself covered with a water proof material other than the vinyl to keep it from absorbing water? There is a water barrier between the vinyl and foam cushion. How are the bases to be attached to the pontoon deck? These bases are connected with 4 wood screws per base.